The news making waves all over the social media at the moment is the written document sent to United Nations wherein the Tiv people of Middle Belt of Nigeria is seeking for the independence from Nigerian defunct federation. Having gone through the written document of the Tiv tribe to United Nations, I discovered that it is only seeking for self-determination which will culminate into the independent state of Takuruku Republic as demanded by the indigenous people of Tiv nation which will only save them from the genocidal venom of the Nigerian government's agent of terrorism called Fulani herdsmen in the next few years. It could be recalled that from the platform of this Family Writers Press publication website which is Biafra Herald, we have made several calls to the people of Middle Belt of Nigeria to demand for secession from Nigeria as the only escape route of the people in the hands of Fulani herdsmen judging by the present wave of Fulani herdsmen attacks and killings in Middle Belt of Nigeria. As 2019 General Election of Nigeria is drawing near, most of you people will soon forget the evil devastation visited on your people by Fulani marauders in the guise of herdsmen when Alhaji Abubakar Atiku, one of the grand Patrons of Fulani herdsmen will mount the podium in Makurdi, Jos, Lafia, Jalingo and Southern Kaduna to canvass for your votes before 2019. Many poverty stricken indigenous people of Tiv nation and others in Middle Belt axis of Nigeria will see cartons of soap, bags of Rice and cartons of Indomie and forget that what they want is no more Nigerian political advantage in the already dead Nigeria but outright secession of Tiv people out of Nigeria of shame and disgrace. For Tiv people to show seriousness in their new found decision to secede from Nigeria, they must adopt the epoch-making NO ELECTION campaign, other media campaign method of IPOB as their approach in Tiv land. Tiv people must unanimously reject Nigeria and everything in it including it's elections as the people of Biafra worldwide under the supreme command of Mazi Nnamdi Kanu, have rejected Nigeria and everything in it including political appointments. If Tiv people fail to differentiate between their demands of independence and erroneous political advantage, soon the cabals managing Aso Rock and their terrorists called Fulani herdsmen will laugh at you people. who is ready to lay down his life for the people in Tiv land just like Nnamdi Kanu has practically lost everything for Biafra? These are expensive questions which Tiv tribe must answer as they are embarking on this noble journey to political and economic freedom. 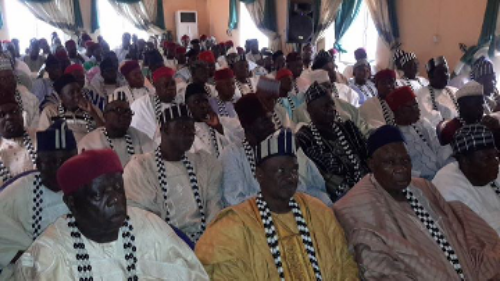 Although, as it is obvious that such men of unquestionable integrity like Mazi Nnamdi Kanu do not exist in Tiv land but hungry political beggars like Mr Paul Unongo, Mr Abubakar Tsav, Sen Joseph Waku and others are the only people they have, so let the Tiv youths begin to protest for Takuruku Republic after all freedom fighting is never for the aged anywhere in the world. The youths should not wait for the elders to do so for them because very soon the Nigerian government will buy over all the people you call elders in Tiv land with "Ghana Must Go" bags of money and they will turn against the masses. If the Tiv people misses this opportunity to free themselves from Northern Nigeria territories, a time will come when Fulani terrorists masquerading as herdsmen will be slaughtering Tiv people openly and nobody will query them because they are doing the bidding of Nigerian government to keep Nigeria together. It is time for Tiv youths to read riot act against those useless politicians in the Middle Belt or Tiv land in particular who will be bought over by Aso Rock cabals to stay away from the demand for Takuruku Republic project. But if the political bubble of next year in Nigeria make Tiv people to dump the demand for proposed Takuruku Republic, then the name of the present generation of Tiv tribe and generation unborn is going to be "SORRY" because Fulani terrorists all over West Africa are coming against you people with great anger due to the anti grazing law. In conclusion, it is only outright secession from Nigeria will save Tiv people and not the instrument of self defense contained in United Nation charter because if Nigerian government defiantly begin to sentence your people for possessing arm in the mode of self defense, United Nations can never do anything to stop it as the case with Biafra which Nigerian government has being killing. Just stick tenaciously on the quest for Takuruku Republic. A word is enough for the wise!